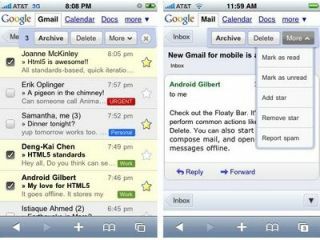 Google has announced changes to the engine that powers its online version of Gmail for mobiles, enabling users to interact with messages more simply and offering more offline options. Based on the new HTML 5 standards, users of the Android or iPhone/iPod touch browser will be able to access their webmail even if offline, with the sending and receiving completed when connection is restored. While this isn't a new option (the Gmail app for mobiles has been around for a while) being able to perform it in the cloud is a cool new addition. Google has also promised that opening emails, navigating and searching through your inbox will be quicker, thanks to "aggressive caching and by leveraging new browser technologies, like HTML 5 and Gears". The new floaty bar (we don't know why it's called that either) will also allow users to archive, label and delete messages easier than before, when a message is selected a bar pops up with a number of options and stays at the top of the screen. However, searching through the mail still needs a scroll-a-thon, although this is now located at the top which is much easier. Other changes are more cosmetic, such as easier to view labels and messages. If you're an Android user, then you'll be able to get your hands on the new upgrade now, and for you Apple-ites, you'll need iPhone/iPod Touch OS 2.2.1 or above.